The engine bay of Jessica Barton's old Anthracite car. 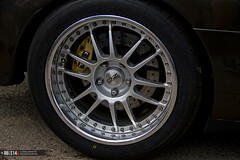 Detail shot of Jessica Barton's wheels, OZ Racing Superleggera IIIs. 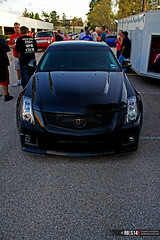 Cadillac CTS-V in the parking lot of the Omni. The two people in the background on the right are 'SW' in black and Jessica Barton in pink, the white trailer they're leaning against contains SW's 1500+ whp Underground Racing twin turbo Lamborghini Gallardo Superleggera. Cadillac CTS-V in the parking lot of the Omni. The two people in the background on the right are 'SW' in black and Jessica Barton in pink, you can see SW's 1500+ whp Underground Racing twin turbo Lamborghini Gallardo Superleggera peaking out from the trailer's open hatch. 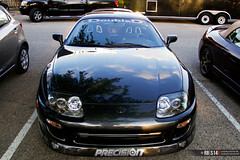 Jessica Barton's 8-second Supra, RIP. 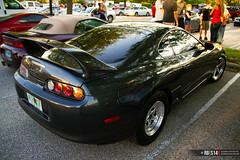 Several months after the event this car was stolen from her home. 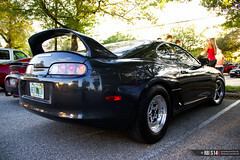 It was found a few days later at a chop shop, stripped of parts and cut into pieces.